What does it take to write a book? Wisdom? Intelligence? Insight? The right answer: Patience! 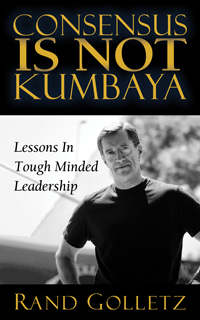 I finished my book, Consensus Is Not Kumbaya … Lessons In Tough-Minded Leadership, over a year ago – or so I thought. Here’s where we are: We have completely edited the book three times. Each time, we have found things we wanted (or in some cases, NEEDED) to change. I’m now done with it … I think! Morgan James, my publisher, completed their initial book design. My editor, Barbara McNichol, and I liked many aspects of that design. There were a few other aspects we did not like, and as a result, MJ is refining their design. I’ll see you in November. Until then, get real, get tough and get going! My client Frank (not his real name) had just been elected Chairman and CEO. His promotion was wildly popular and widely celebrated. His company, a Fortune 500 firm with more than 100,000 associates and 80 operating divisions worldwide, had elected only eight chairmen in its 100-year history. All had been life-long associates. The company had a history of ascending growth and earnings and a stable corporate culture, including corporate values that management both talked and walked. From an investor’s point of view, this was a “buy-and-hold” stock. At the time of his election, Frank was 55 years old. Until his early 40s, his career was successful but unspectacular. No one really pegged him as “the guy” until the chairman at the time put him in charge of the firm’s largest division. There, he hit a home run; actually, he became Babe Ruth. To continue the baseball analogy, he led the league in home runs for the next decade, was made vice chairman at the age of 53, and placed in a head-to-head “competition” for the top job with the impressive president and COO. Tough-minded without being hard-headed, Frank has five distinct strengths. He’s gifted at selecting and developing associates. He communicates extremely well with people from all walks of life. He’s an incredible listener, enveloping people with his attention. He also “connects the dots.” In corporate parlance, it’s called integrative thinking. His biggest strength, however, is his self-knowledge. Acutely aware of his strengths and weaknesses – personal as well as professional – he has never dismissed his shortcomings as irrelevant or unimportant. He creates “workarounds” to compensate. I asked them to write a definition of that word and hand it to me. They did. I then collected and read the definitions, without attribution. They differed greatly. For some of them, consensus had something to do with voting before deciding. For a few, it had to do with reaching unanimity before executing major decisions. Still others had different ideas. I gulped and continued, “When I spoke to each of you individually about Frank and his style, you all used shorthand to express your thoughts. I heard the word ‘empowerment’ eight times. I heard the word ‘delegation’ just as often. Several of you used the word ‘autocrat.’ The word I heard most often was ‘consensus.’ Each of you used those words as if we should – or DID – automatically agree on what they meant. To start, we spent two hours – two hours – on what the word “consensus” would mean to the team going forward. Here’s what we concluded: Consensus would mean that before action would be taken on issues above a certain threshold, all team members could and would support the decision, even if they didn’t believe it was the best possible decision. Consensus would not imply how a decision would be reached. Some decisions would still be made by Frank – alone with no input. Some would be voted on. Some would be debated in advance. Some would not. The point is, consensus would not imply the decision-making process employed; it merely would imply whether active support for a decision existed. In this case, whether their definition comported with Webster’s definition was less important than their recognition that common understanding was critical. What are the implications for you? Never, ever, ever assume that you and your team are on the same page unless you’ve tested for understanding, debated issues, worked hard to surface objections, and considered alternatives. Agreement isn’t always necessary, and consensus isn’t about creating a “kumbaya” management approach. This entry was posted on Saturday, October 9th, 2010 at 1:40 am	and is filed under The Real Deal. You can follow any responses to this entry through the RSS 2.0 feed. You can leave a response, or trackback from your own site. Rand views each speaking engagement as a unique opportunity to share his expertise. He works closely with each meeting planner to discover precisely what elements will work best for their audience.